Classes at HANDS ON focus on sound structure and use of materials for traditional bookbinding and the execution of artist books. Students will benefit from Priscilla’s years of production binding, learning methods that offer speed and efficiency without compromising quality of the work. Registration details appear at the end of class listings. Truth or Consequences is a popular hot mineral water spa town with a range of accommodations. Hotel recommendations will be made upon registration. LEARN OR REVIEW THE BASICS for making a traditional case bookbinding at this one day workshop. 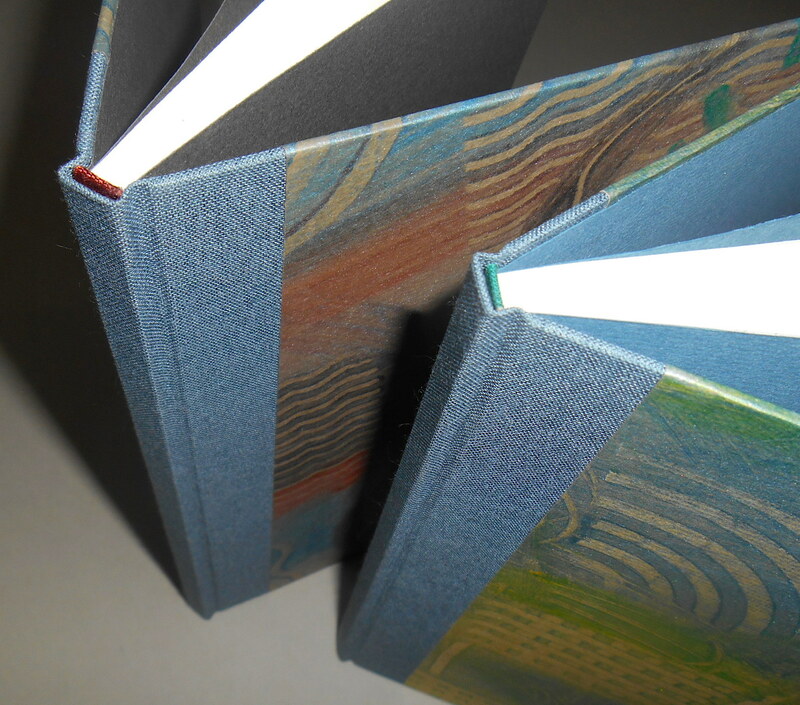 Students will hand bind one 1/4 cloth, flatback case binding (cloth on the spine, decorative paper on the boards). Methods learned prepare students for all future Hands On Bookbinding workshops, whether choosing a path to traditional fine binding or focusing on artist book structures, or box making. Bookbinding Warm Up is a Prerequisite for all other Hands On Bookbinding workshops. Class limited to 6 students, 3 minimum. Repeats Saturday, February 16, prior to a next level class. THE ROUNDED SPINE for Case Binding. Building on the techniques taught in the Bookbinding Warmup class, students will learn to shape (round and back) the sewn text, paying close attention to the control and use of spine swell created by the folded and sewn sections. Two rounded case bindings will be made during this workshop: one bound in quarter cloth and decorative paper and the other covered in full cloth. Students gain more experience in measuring, cutting, assembly and casing-in books. Class limited to 6 students, minimum of 3. 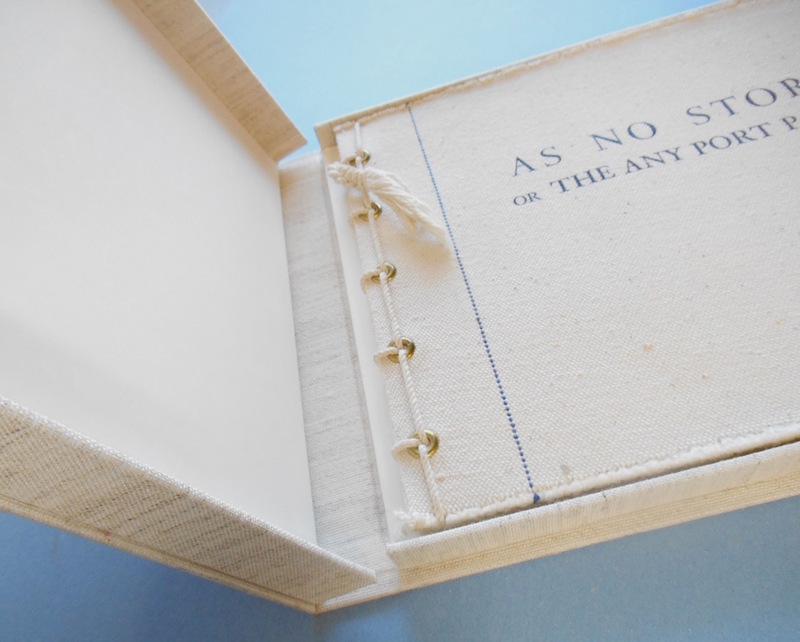 The drop-spine box, popularly known as the clamshell box, opens like a book. It is constructed with an outer case, which has two interlocking trays attached to it. Versatile, it can be used to protect and house books, prints, photos, or other unusual objects. Each student will first make a pre-cut 8-1/2 x 11 inch box to learn the sequence of assembly and covering. Then they will have an opportunity to custom make a box for their own personal item, no bigger than 11 x 14 inches, by 1-3/8 inches deep. All boxes will be covered in bookcloth, and lined inside with paper. A clamshell box is a three-dimensional object, and will require spatial thinking and some precise measuring and hand cutting. Simple and useful techniques will be taught to ease this challenge. Class limited to 4 students. BOOKBINDING WARMUP is a Prerequisite. NOTE for ONGOING STUDENTS who have taken my box class before, students go directly to working on a box for a personal project, or are introduced to other housing methods such as the slipcase. * Upon request, class may repeat later in Spring 2019. Otherwise, it will be included in the Fall 2019 lineup. $235. ~ leather, materials included. Further refinements of the case binding are featured in this class that introduces working with fine goatskin leather. Students learn to pare leather on paring machines. Two books will be completed: a 1/4 leather rounded case with decorative paper on boards, and a 1/2 leather rounded case, which adds leather to the four corners and decorative paper in the center of the boards. Case joints (hinges) will vary in width between the two bindings, the first with the usual pressed groove used on most case bindings; and the other, bound with a tighter joint for a continuous contour, enhanced by back-cornered boards and a shaped, rounded headcap at each end of the leather case spine. NOTE: in order to complete the two leather books over two days, students will be instructed to prepare two sewn texts prior to arriving for workshop. Prerequisite: Hands On Bookbinding’s Bookbinding Warmup and The Rounded Case classes. Upon request, The ROUNDED CASE may be repeated again just prior to this leather course, an option for many out of town students, becoming a 4-day intensive course! Class limited to 5 students, 3 minimum. Additional fun with alternative book structures. (Saturday & Sunday) 9:00am – 4:00pm . 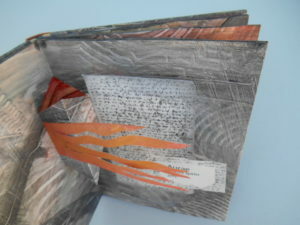 Book Structures designed to help the artist/student to think ahead when binding an artist book, but without compromising the spontaneity of their creation. Departing from traditional binding, these bindings use little adhesive during construction and more flexibility at the spine to compensate for later additions, such as collage, photos or for engineering pop-up spreads. Two books will be executed during this workshop with techniques including sewing on exposed straps for one, and the second book made with folded text pages that are tipped (glued) together instead of sewing. Both bindings allow the text to lay flat when opened to view full spreads. Bindings require no pressing and very little adhesive. What could be more perfect for the artistic temperament? ONGOING Students may work on special projects using these techniques during class time, such as the sliding strap book that can be displayed on the wall. Prerequisite: BOOKBINDING WARMUP. Class limited to 6 students, 3 minimum. $225. ~ leather, materials included. 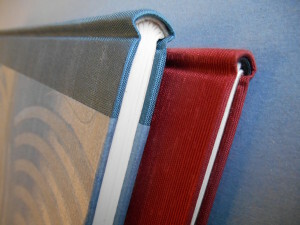 This class transitions the student from the case bound book to the concept of the spine hollow and “in-boards” binding, where the boards and the book spines are attached to the text block before it is covered. Students will focus on one elegant binding based on the Millimeter style. This structure utilizes an attached spine/paper component that acts like a spine hollow and extends over the spine shoulders to the endpaper linings, eventually to be used as a flange for the board attachment. 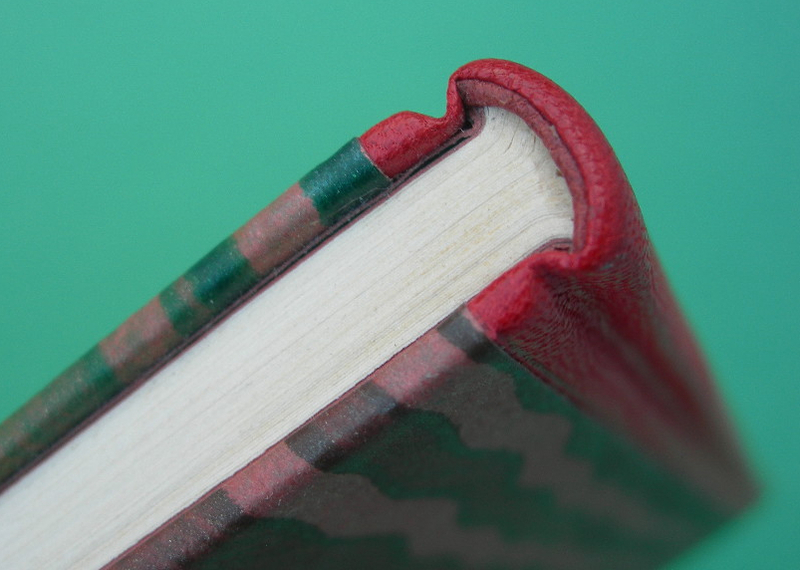 Small amounts of leather are applied to the spine and fore-edge of the book boards, then trimmed down to literally millimeters along edges, which brings attention to the decorative paper on the boards. 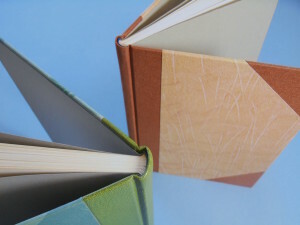 Prerequisite: Hands On Bookbinding classes: Bookbinding Warmup, The Rounded Case, and Case binding Refined. Class limited to 5 students, 3 minimum. This class is designed to transition students to future classes in laced-on boards binding, or fine binding. Class size limitations depends on course, from 4 to 6 students (depending on class) minimum of 3. Priscilla’s past students may bypass the Bookbinding Warmup prerequisite, upon approval. A deposit of $75. is required to hold a place in a class, $100. for leather classes. Balance due by workshop date. Deposit by check is preferred, but Paypal payments may be sent for balance of tuition. A two week notice of cancellation is necessary to receive full refund of deposit or any prepaid payment.